This is my review for the TotalDAC Ethernet cable, which I bought to use with the SOtM sMS-100 network player. The purpose of the TodalDAC Ethernet cable is to take care of the radio-frequency and electro-magnetical interferences that can be picked up and travel through the network lines, degrading or limiting the digital performances in a HiFi system. 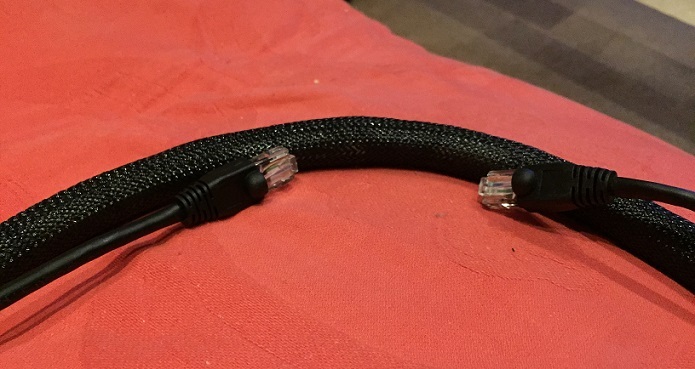 The way the TotalDac cable has been designed is quite unique, because it doesn’t have a specific “filtering point”, such as a box, but the cable works as a filter in its entirety. For most of its length (excluding the extremes), the cable is very thick and heavy. 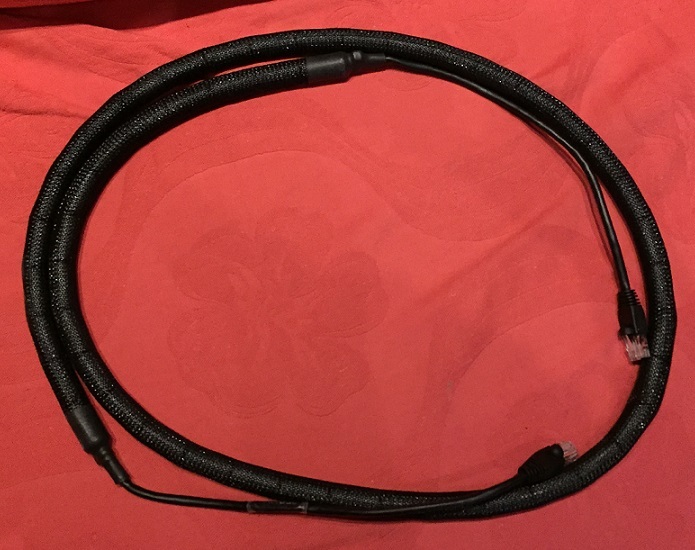 The thick layer aims to achieve EMI resistence (by minimizing capacitive and inductive properties of the cable to suppress the antenna effect), and it also tries to attenuate what is already traveling inside the cable, throughout its whole length. The minimum length of 2 metres seems to be related to the latter objective. I have positioned the TotalDAC Ethernet cable between the router and my battery based SOtM sMS-100 network player, feeding the digital signal to two DAC’s: the AMR DP-777 and Lector Digicode S192 (my new favourite). I have been using Stax SRM-007t and SR-009 electrostatic headphone system, and Luxman L58A integrated amplifier with Mordaunt Short Performance 6 speakers. The filter has the effect of lowering the noise floor. Tiny things sound more pronounced or noticeable, they have more natural decay and are placed in the soundstage with better definition and delicacy. If I remove the battery PSU of the SOTM, and use the stock switching PSU directly connected to the wall, the overall system performance degrades a bit, resulting in a loss of clarity and bass articulation: in this situation, the Totaldac ethernet cable doesn’t magically clean up the sound, and the improvement I could hear before in listening nuances is less detectable. It’s possible that the reduction in EMI noise is less relevant compared to the higher noise floor caused by the worse power supply. The biggest difference seems to be made by the receiver (in my case, the SOtM), depending on tight filtering it will employ towards incoming EMI, how it is already impacted by other sources of noise, and how EMI propagation is treated after that point. Just like the JCAT usb card, the 5v batteries for certain twin usb cables, or iFi iUSBPower device, the TotalDAC LAN cable could be categorized as an “incremental upgrade”, which gives its best under certain conditions: it can shine after removing other bottlenecks (here represented by other sources of noise), or because it compensates shortcomings in EMI filtering at the network player’s end. It can be a welcome addition in a high-end computer-based system, by adding delicacy and refinement, which is the way it works in my system, complementing a very cost-effective solution based on the SOtM transport and battery PSU; or it might not warrant enough difference if a system is not transparent enough, or, theoretically, if a very high-end network player already employes expensive EMI filters that make it insensitive to upgrading the network connection.